The Revolution SVR Bianco Ping Pong Table is a fusion of luxury, style, quality and attention-to-detail. 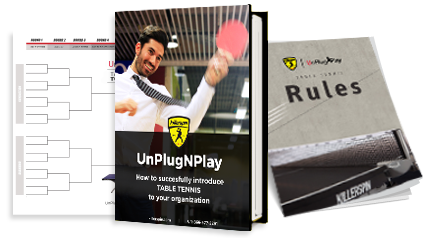 Killerspin proudly exists to connect families, friends, customers and employees through luxury table tennis equipment. Killerspin Revolution SVR Ping Pong Table is beautifully designed to look good at home, or in the office. The flat white finish with gloss white lines give this ping pong table a sleek, classy look. Alubond, a marriage of steel and aluminum, forms a solid base for the 1” MDF table tennis top. Adjustable legs ensure the surface is perfectly level, and a convenient drawer on each end provides storage space for ping pong paddles and balls.